Our plus size deluxe she devil costume is an exclusive Halloween Costumes devil costume for women. Get this devil Halloween costume for a great price. Become a beautifully deceptive demon for Halloween in this deluxe She Devil costume! 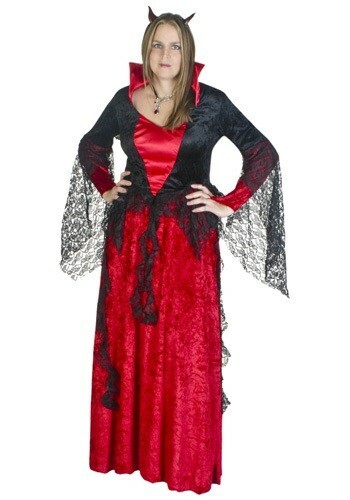 The plus size costume includes a polyester dress that has the appearance of crushed velvet. The top portion is black with a red inset and collar. The sleeves also feature red ends which hook onto the middle finger and are layered in black lace. Black lace also creates a shell around the waist of the skirt as well as hangs freely from the waist. A black tulle petticoat is also included to give the dress volume. The costume is complete with a horn headband. Two red latex horns with black accents are adjustable on the black elastic headband. This fall, bring out your devilish side in this exclusive costume!